It must be breathtaking to have Samsung Galaxy Note 8, because it is not only a business like phone to help you do the-work-related, but also a nice-look one for daily use and entertainment. After download and installing the apps or tools you like always, selecting a decent music app for your brand new Samsung Galaxy Note 8 should be considered. Here are some of the best streaming music apps recommended for your Samsung Galaxy Note 8 and the specific ways to download streaming music from Spotify, Pandora, Google Play, YouTube, VEVO etc to Samsung Galaxy Note 8 for offline enjoying. Spotify is regarded as the best streaming music app for Android because of its massive catalog and emphasis on social connection. These great features make an amazing listening experience indeed. The biggest attraction is the wide variety of ways provided for you to discover new music. 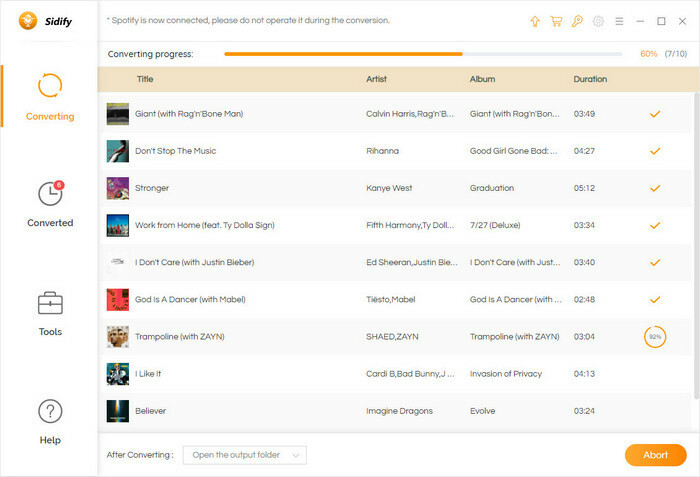 It is easy to create your own music playlists to manage and listen to music and import more local music for playback. The other features you might be interested in are its social connection to share music with others or discovery more music from your friends and support for Chromecast to listen to music out loud. If you are premium subscribers, you can download and sync Spotify music on multiple devices like Note 8 or computer for offline enjoying without limitations. So today we introduce another way to free download Spotify music to Samsung Galaxy Note 8 if you are free users, or want to cancel subscription temporarily. That is to rip DRM protection from Spotify music and get DRM-free Spotify music like MP3, AAC, WAV, or FLAC, so that you can stream Spotify music to Note 8 or other devices freely. Spotify Music Converter Free is here waiting for your test. Here are the specific steps on how to free download Spotify music to Samsung Galaxy Note 8. Step 1: Import Spotify music to Sidify Music Converter Free. 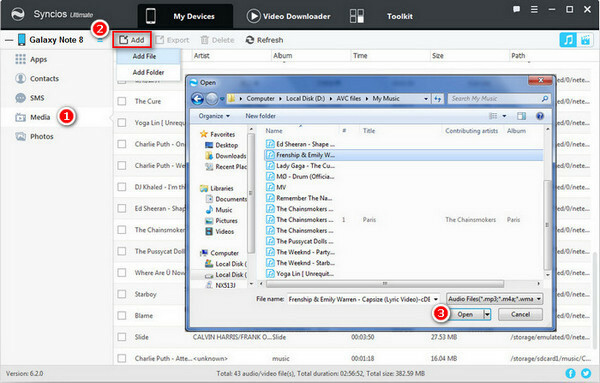 Download and install Sidify Music Converter Free on PC, then run it. Go to Spotify app or website to copy music URLs, and click button on Sidify Music Converter Free, then a pop-up window will show to allow you to paste the URLs. Drag or drop music from Spotify is also permitted. Step 2: Choose the output format you prefer. Just click Setting button on the top right corner to choose output formats supported by Samsung Galaxy Note 8, such as MP3, AAC, WAV or FLAC, set output audio quality (320kbps, medium 256kbps, low 128kbps) and output path. Step 3: Start downloading Spotify music. Click "Convert" button to start downloading Spotify music and click to find the output files. Step 4: Transfer downloaded music to Note 8. Connect Samsung Galaxy Note 8 to computer with USB cable, then copy the downloaded Spotify music to Note 8 directly. Or you can use Samsung Mobile Transfer to transfer more music in one-click. The online music or video sharing sites like YouTube, Vimeo, VEVO, SoundCloud etc are also great sources to discover music or music videos. The sites like YouTube, VEVO provide users more than 50,000 official music videos, live performances and original shows from super stars. You have chances to free enjoy a full HD music experience that covers everything from the latest premieres to the best classics. They are It is great places to watch your favorite artist’s music videos and approach to MV from Justin Bieber, Adele, Beyonce, Rihanna, Lady Gaga etc. SoundCloud is great place to share music content and find new artists, here you can upload your own work or hear others' work. And if you want to download online music from these popular sharing sites to mobile devices like your Samsung Galaxy Note 8, iPhone, iPod etc, Any Video Converter helps you download online music to the formats like MP3, M4A, AAC, OGG, WAV, WMA, FLAC, APE etc supported by Samsung Galaxy Note 8. Step 1: Copy the URLs of music or music videos from YouTube or SoundCloud sites. Then click on "Download Music Files" from drop-down menu on "Add URLs" button, and a dialog will pop up to let you paste the URLs. Just continue to paste more music links as the previous steps. Step 2: Click "Start Download!" button to start downloading online music. Step 3: Transfer the downloaded online music to Samsung Galaxy Note 8 with USB cable or Syncios Samsung Manager. Tips: Or you can convert online music you downloaded to more audio formats like MP3, AAC, OGG, WAV. 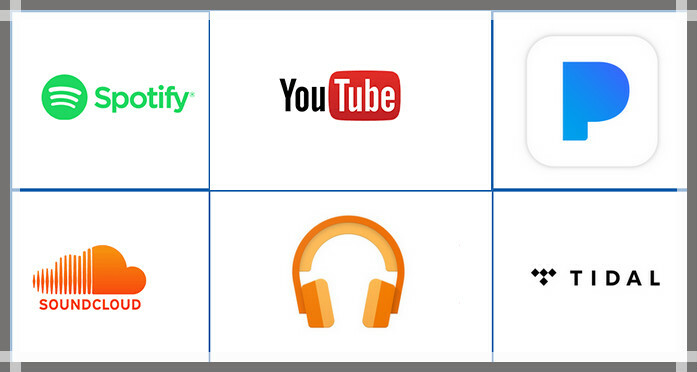 Here are the most useful ways to download music from streaming music services like Spotify, Google Play and Pandora, and the best ways to download online music from YouTube, VEVO or SoundCloud. You can choose any one you prefer to import more music to Samsung Galaxy Note 8 to bring music everywhere.